There are several ways that you can use these (as well as your own) cards. A teacher may create her or his own cards for each chapter or unit. One may then add each new chapter or unit's cards to the growing "card bins" so that each chapter or unit's review includes a review of the previously learned material; in this way, students are less likely to forget material over the course of the year. Others may save the combining of cards until it is time for a semester or end-of-the-year review. More importantly, you will be teaching your students a fun studying strategy that will stay with them beyond your classroom. NOTE: If you are looking for trivia questions on a particular topic, they will be found under the subject listing. For example, if you need questions related to the Renaissance, go under "Social Studies" to "World History" and look under the Renaissance-related headings. Click here for our free printable game boards with instructions. Are you instead looking for test-prep games and practice tests you can do online? 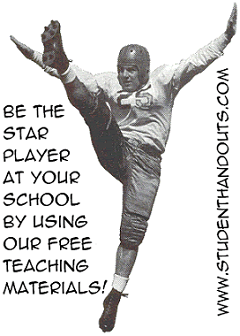 Click here for our large selection of free interactive educational games. For more of our items for free printable study games, click here. Our free printable game boards with instructions are available here and here. If you are creating your own game cards, the obvious choice is to use regular index cards. The prepared sheets below should be printed onto card stock, then cut along the lines to form Q&A cards. They are general examples of questions. If you are looking for something more specific, look under that topic. If you need review questions for the French Revolution, for example, go under "World History." Blank Trivia Cards - This blank sheet can be useful if you want to create cards which match the size of the cards on the sheets linked below.